Most people are aware of the hazards of winter driving – snow, ice, wind, darkness. But summer driving is not without its risks. Many of the dangers of summer driving come because there are more people on the road – and not all of them are good drivers. 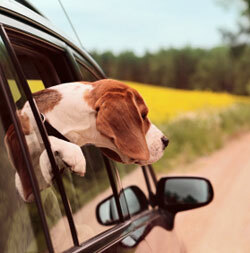 Some drivers tend to relax more behind the wheel in the summer than in the winter. The nice weather can give drivers a false sense of security, and drivers heading to the beach or on similar outings may be distracted by the fun they expect to have. Of course, some drivers returning from outings may have been drinking, which adds another element of concern. In summer, cars and SUVs have to share the road with more RVs, motorcycles and, depending on where you drive, farm equipment. Tractors and RVs generally move slower than other traffic, so be patient if you find yourself behind one; pass only where it is legal and safe to do so. And keep an eye out for motorcycles, especially if they are weaving through traffic. Summer is also construction season in most of the country. This can lead to detours, narrowing of lanes, closed shoulders and other changes in traffic patterns, which can be confusing and frustrating for you and for other drivers. Take your time through construction zones. It’s not only safer, it can save you money; many states are clamping down hard on drivers who speed in posted work zones. Vehicles are not the only things on the road in summer. Drivers often have to share the road with more pedestrians, joggers and bikers – including too many who are wearing headphones. Give them plenty of room. And when you park, look before you open your door, so that you don’t open it into the path of a runner or biker. Children also can be a hazard to summer drivers. Especially when you are driving through residential areas or near parks or playgrounds, go slowly and be alert for children darting into the street to retrieve a ball or get to an ice cream truck or simply to cross the street. Dogs can present similar hazards. Although you don’t have ice and snow in summer, you can have rain and flooding. Never drive through standing water, and avoid driving over creeks or rivers in heavy rain. If you are having trouble seeing during a rainstorm, pull over until the storm passes. Heat can also be a problem. If you are taking a long trip, be sure to bring plenty of water. And never, ever leave children or pets unattended in a closed car. If you are driving on your summer vacation, have your vehicle checked by a mechanic before you go. Top off the fluids, check the tire pressure and tread, and test the headlights. Never pack your car so full that you can’t see out the back window. And make sure that bikes, car top carriers, etc., are attached securely before you pull out of the driveway. Finally, always buckle up. And then, enjoy the trip.